As you look into building a new backyard pool, you will most probably come across the word “gunite.” So, what is gunite and how is it different from concrete? And what about shotcrete? Is it the same as gunite? In essence, gunite is a mixture of sand, cement, and water applied via a pressure hose forming a hard concrete layer perfect for swimming pool walls. It is regarded as one of the strongest pool construction materials available today. Gunite pools are known for their impressive designs, flexibility, and beauty. For years now gunite has been the preferred material in pool construction where it is paired with another element such as steel to enhance its stability. After excavating the hole for a new pool, a network of still bars is placed at precise intervals forming a cage-like frame that covers the entire pool. Extra steel bars are used on the deep end of the swimming pool for extra reinforcement. Usually, the cage is suspended in the air to create ample space to be filled by gunite. Next gunite is sprayed at high pressure across the pool forming a dense wall and pool floor. After the gunite cures, plaster is applied on it to ensure a smooth surface and added aesthetic value. The plaster is the shiny surface you see on the walls and base of the pool. This one of the most exciting features about gunite. It is highly adaptable to any pool form, producing different contours, depths, and shapes. With gunite, pool design options are limitless, from curves to sharp angles designs gunite is the ideal material. This versatility makes it the perfect material to construct high-quality pools in limited spaces. Few pool construction raw materials can match the strength of gunite. Fiberglass and vinyl may allow for a faster installation, but the finished product will not be very strong which raises the durability question. Once sprayed, it forms a rock solid structure that can last for years. Pools with a strong foundation are less prone to contamination and are much safer to swim in. This goes down to the material's versatility. Its ability to adapt to any pool shape ensures that the result is a visually appealing pool. While constructing using gunite, your imagination is your limitation. You can virtually make a pool of any shape. For decades gunite has been the preferred pool construction raw material all over the world. The key to its performance is its flexibility and high tensile strength. It is also preferred for commercial undertakings such as in hotels and restaurants. Today it is rare to see a hotel with any other pool other than a gunite pool. It is vital to note that gunite and shotcrete are all forms of concrete. The main variation between the two is in their composition. Guniteis a dry mix and water is added to it at the construction level. Shotcrete, on the other hand, is mixed prior to construction and has a mixture of gravel which gunite doesn’t have. The two materials also differ in regards to their usage in pool construction. For gunite, sand and cement are availed to the job site. They are then held in a container before being fed into a mixing system. The mixer feeds the dry gunite into a high-pressure hose and later mixed with water before being applied to the steel cage. For shotcrete, the material is made up of cement, pear-sized gravel and sand. These materials are first fed into a truck with a rotating barrel. The barrel also contains water and mixes the materials to produce a smooth mix, which is ready for use before the truck arrives at the construction site. However, the terms gunite and shotcrete are used interchangeably as they offer similar qualities in pool construction. Both are strong and adaptable even though gunite is more preferred due to the ease of application. In a nutshell, both materials are durable in pool construction, and a professional will make a decision on which material to use based on the prevailing local factors. 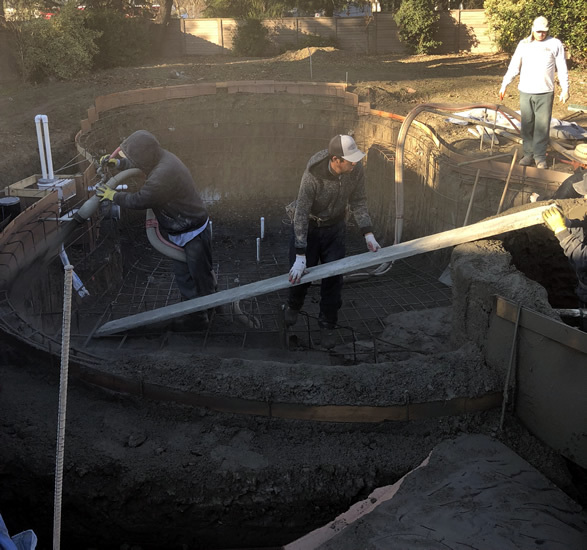 At Sac Pool Pros, we are the ideal Sacramento gunite pool constructors. Our technicians have been in the pool construction space for years and are experienced in the craft. We are alive to your quest of having a strong gunite pool in your backyard or hotel. Contact us today, and let us make you your dream pool.